The emerging threat of MDR-GNR featured heavily throughout the progamme. There were several important updates on colistin resistance, particularly in Enterobacteriaceae. Following on from the discovery of plasmid-mediated colistin-resistance, multiple “seek and ye shall find” studies identified mcr-1 already present throughout the world. In one study, mcr-1 was identified in 6 Dutch returing travellers…from 4 continents! But it’s not all about plasmid-mediated colistin resistance. We reported a high rate of colistin resistance (around 70%), and clonal spread of two distinct types of mutational colistin resistance during a clonal outbreak of NDM-producing K. pneumoniae, which I fear may be the shape of future CPE outbreaks. Our understanding of the basic epidemiology of MDR-GNR is limited, and this is limiting our ability to build bundled interventions. DNA-based approaches to diagnostics for CPE may well be useful to improve turnaround time, but they can only detect a selection of carbapenemases. We reported an outbreak of GES-5 producing K. pneumoniae CPE, which was missed both locally and by the reference laboratory; this should serve as a warning to think beyond the “big 5” carbapenemase in our diagnostic algorithms. We also presented some work showing that repeated admission screens do not improve diagnostic sensitivity in detecting CPE carriage, so current PHE guidance may need to be reviewed. There are some pretty huge European studies going on that provide new information on the epidemiology of MDR-GNR. Key messages include that K. pneumoniae seems to be more transmissible than other E. coli, around 5-10% of hospital carriage of Enterobacteriace is explained by cross-transmission, and ‘endogenous selection’ (where something about hospital exposure unmasks pre-esisting resistant Enterobacteriaece carriage) is probably more common than genuine acquisition. Also, despite a number of attempts, decolonization of MDR-GNR carriage using antibiotics is largely ineffective, and microbita modulation may be a better approach. Despite this new data, we are still no closer to knowing what works to prevent the transmission of MDR-GNR! “Community-acquired” CDI has been banded about for some time – my view is that there is likely to be a fairly low but stable background level of community-acquired CDI, with most community-onset cases being explained by previous healthcare exposure. PHE presented some data which largely supports this view, identifying previous healthcare exposure in a high proportion of CDI cases identified within the first 72 hours of hospital admission. There was a fair bit of discussion about FMT for treating recurrent CDI. Although this approach works – no doubt about it from the van Nood RCT – there are some important barriers that have prevented widespread adoption. An important presentation reviewed long-term outcomes in patients treated with FMT, identifying very little collateral damage. However, there a small number of unthinkably gross occurrances of reflux and vomiting of donor stool; fortunately, this unpleasant consequence seemed to be eliminated by protocol modifications (e.g. reducing volume of stool, and fasting before and after the procedure). Andreas Voss and Yves Longtin had an engaging duel on whether or not to continue to control the spread of VRE. The general consensus was that although VRE control measures are costly and difficult to implement, they work and should be pursed, especially in high-risk settings. Dr Longtin introduced us to the idea of ‘DLVRE’ (daptomycin, linezolid AND vancomycin-resistant enterococci): a pretty good reason for continuing with control measures. And both agreed that, regardless of your views on controlling VRE, it’s an indicator of system failure (a canary in the mine, if you will)! There are forthcoming WHO guidelines on SSI, and there was an excellent session on the prevention of SSIs. It was a little concerning that 4/10 presentaitons were reviews, perhaps suggesting that we are short on high-quality primary data around SSI prevention? Key messages from the session were that closed doors, a single dose of antibiotic prophalyxis (vs. a short course), hypoglycaemia, and hyper-oxygenation should make inroads in preventing SSI. There was a strong systematic review concluding showing that prophylactic mupirocin for S. aureus carriers reduced the rate of SSI – but I worry about mupirocin resistance if this was implemented widely. Semi-automated surveillance, by matching procedure codes, diagnosis codes, microbiology databases, and hospital admissions data can enhance and extend traditional surveillance approaches, and it was good to see a semi-automated SSI surveillance algorithm for orthopaedic procedures performing well. The antibiotic pipeline is drying fast, so we need to think creatively to develop new antimicrobials. Sarching through ancient medical literature may revive effective antimicrobials (aka ‘AncientBiotics’), phages continue to be so near and yet so far hitting the clinic, and antimicrobial peptides may help to enhance the waning activity of existing antimicrobial agents. However, there’s no game-changing therapy on the horizon so it’s likely to come down to preventing the spread of pan-drug resistant bacteria. Lance Price gave a compelling lecture on antimicrobial resistance in the food chain, coining the phrase “foodborne UTI”. I wonder whether “food-associated UTI” (FAUTI) and “food-related UTI” (FRUTI (!)) may be better terms! We are pumping huge amounts of antibiotics into the food chain (human medicine consumes 3.5 million kg of antibiotics each year, compared with 15.4 million by food animals in the US each year). So it’s little surprise antibiotic-resistant bacteria commonly make it into the foodchain. Addressing this issue will require a change in approach in animal husbandry, which has relied too heavily on antibiotics for too long! I was delighted to be asked to participate in a session on social media for healthcare professionals. You can see the results of the Social Media Survey that I ran for ECCMID here. I do think there is a place for social media (especially twitter) at conferences, and it was fun to see the conference hashtag (#ECCMID2016) trending on twitter ahead of the usual celeb rubbish! Plus the ECCMID TV youtube channel is an interesting resource. Speaking of handy resources, it’s great that all of the abstracts, most of the slides, and some of the recordings are available for all, for free on the ECCMID website. This should really be the form for all scientific conferences. The only disappointment was the lack of IPC on the programme. 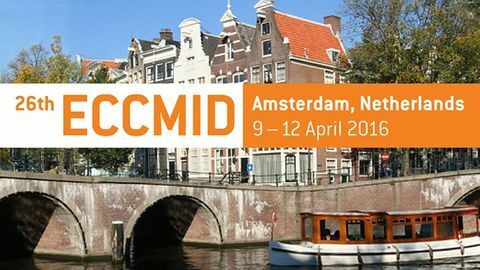 I recognize that ECCMID is primarily an ID / microbiology conference, but it would be good to see a greater focus on prevention at future ECCMIDs. Amsterdam was a tremendous venue – I enjoyed going native and hiring a bike to get around (although it is mildly terrifying to cycle during rush-hour in a Dutch cycle lane). Many thanks to the organisers, and I look forward to ECCMID 2017 in Vienna! Thanks for sharing the topics interest discussed in Conference & also sharing web site /you tube address.It’s nice that venue was Netherlands with lots of places to visit beside attending the Conference.